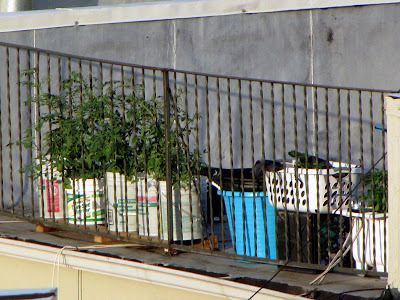 I was able to zoom in on the neighbors' rooftop container garden with my new camera so I've decided to cover their garden progress as well. From what I can see their tomatoes are doing fine. They're a healthy green color, they're flowering and there's no glaring signs of disease. I can't tell what's growing in the other pots, but I like that they re-purposed an old sink and a laundry basket as planters. Thanks for sharing this pic of the neighbors. I like the repurposed laundry basket and sink too.